First Line: Captain Bill Lucky swaggered down the Duck Shoppes boardwalk with his roving eye cast on every woman. 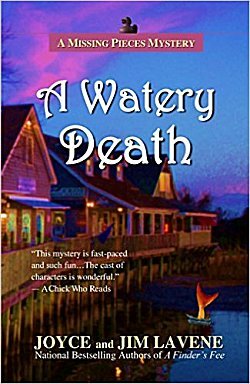 It's the Fourth of July weekend, and thousands of visitors have packed Duck, North Carolina for the festivities... and to learn of the death of Bill Lucky who was captain of the new gambling ship docked there. Mayor Dae O'Donnell has her hands full with the parade, a friend who's turned into a very nervous bride, and trying to get her store, Missing Pieces, stocked for the busy summer season. But when rumors persist of mermaids being involved in Lucky's death, Dae has no choice but to become involved in the investigation. I was a huge fan of this series for the first three books, but my opinion gradually began to change as Dae's "powers" began to change. From being able to touch an object and see its history or touch a person to see where his or her lost item is, Dae began to be able to time travel, and now with this last book in the series, mermaids (and mermen) take center stage. This whole part of the plot just did not work for me, but I kept reading because of my fondness for the main character, the setting, and for the authors of the series (both of whom left us way too soon). The paranormal and fantasy elements weren't the only things that bothered me. The mystery took a backseat to the rest of the action in A Watery Death, and for some strange reason, Dae suddenly decided that she had the right to start making decisions for everyone else. That's guaranteed to rub my fur the wrong way. This book may have ended the series on a bit of a sour note for me, but I do recommend the first three books in the series: A Timely Vision, A Touch of Gold, and A Spirited Gift. They are filled with wonderful characters and a setting that you can see and smell and touch. And I won't even go into the history of the area that you'll be able to learn!